FYI: This is a SPOILER-FREE Turtle post. I won’t ruin Game of Thrones for those who haven’t seen recent episodes yet. Also, you don’t need to watch GoT or The Walking Dead to understand this post – so read on! Wow. The most recent episode of Game of Thrones (Episode 4.08: The Mountain & The Viper) was intense, to say the least. In a TV series that is marked by regular twists and surprises, no twist has shocked me the way this one did. Even after letting the episode sink in, I’m still thinking about it. My reaction to the episode has shifted the more I think about. At first I was pleased: I love when a story – Game of Thrones or otherwise – surprises me. After all, great storytelling should surprise us. Then, I gradually started to turn on the episode. The more I consider the conclusion, the more I’m displeased with it, because I believe the surprise ending sacrificed some deeply interesting long-term plot threads in favor of a short-term shock. Having not read the books, I’m hopeful that I’m wrong and that new, interesting plot threads develop from this conclusion. Games of Thrones and The Walking Dead – two of the most popular shows on TV – both work well in part because each show is willing to do what most TV shows and Hollywood movies will not: kill of characters – or more specifically, kill off protagonists. 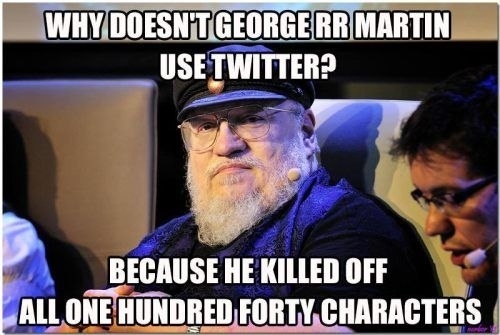 Game of Thrones creator George RR Martin loves to kill off characters! I love superhero movies. Just this year alone, I loved Captain America: The Winter Soldier and X-Men: Days of Future Past. Typically, one of the flaws of superhero movies is that our main protagonists aren’t in any real danger. Secondary characters or villains may die, but when we go to see a Captain America movie, we are pretty damn sure that Captain American is going to survive. (Yes, yes, comic nerds, I know Cap gets assassinated in the Civil War story line in the comics, but that hasn’t happened in the movies – yet.) And even when a main protagonist dies, somehow they always come back – that was half of the point of X-Men: DoFP, to resurrect characters. Thus, superhero movies have to find other ways of being satisfying without the real sense of danger for our main characters. In the Spider-Man movies (and comics) we know Spider-Man will survive, but his loved ones are in constant danger. Also, like in the first Spider-Man movie (2002), we see him lose out on love despite beating the bad guy. In The Dark Knight, Batman survives and beats the Joker, but at the cost of becoming a vigilante and more. However, in every episode of GoT and TWD, we fear for our characters. Each show has proven, time and time again, that nearly any character can be gone in an instant. When Captain America is surrounded by bad guys, we know he’ll survive; when a character is surrounded by zombies in TWD, we have no guarantees. This is part of the appeal and power of GoT and TWD. We are invested in the characters and we’re scared for them. The killing of characters is, typically, warranted in these shows. Both shows are set in worlds filled with chaos, destruction, and death. The core ethos of each show requires that characters not emerge unscathed from all of the horror surrounding them. Yet, for as much as I applaud both shows for being willing to kill off characters, there are times when I wonder if the shows/stories aren’t just kill-happy, and end up killing off better story arcs for the sake of shocking us with character deaths. From a writer’s perspective, the usual stance on killing characters is that a death has to be “earned,” meaning that a character is not just killed for the sake of killing a character; rather, a character has met his/her demise for sound, logical reasons that can be pieced together through the story. Even if we are initially shocked that the character is gone, we should be able – in hindsight – to understand why it happened and how it adds to the story moving forward. If it ever seems like a character was killed simply because his/her name was pulled out of a hat, that isn’t an “earned” death. And if a more interesting story is sacrificed with the death of the character, it isn’t an “earned” death. When a certain character points a finger and yells, “Who gave you the orders?” toward the end of the episode, I immediately foresaw a WORLD of ridiculously interesting story possibilities in terms of character conflicts that could be played out over many episodes. Then, a few minutes later, that was all undercut. The short-term shock replaced the long-term story.